It was August 24th. I had things on my to-do list for the next several days, but I couldn't pass up the invitation from a friend to hike Grand Canyon's South Bass Trail. As a National Park Service volunteer ranger, Sueanne had to check on some archaeological sites in the area, and I was allowed to tag along to keep her company. Neither of us had done this trail, but it turned out to be my favorite Grand Canyon hike yet. 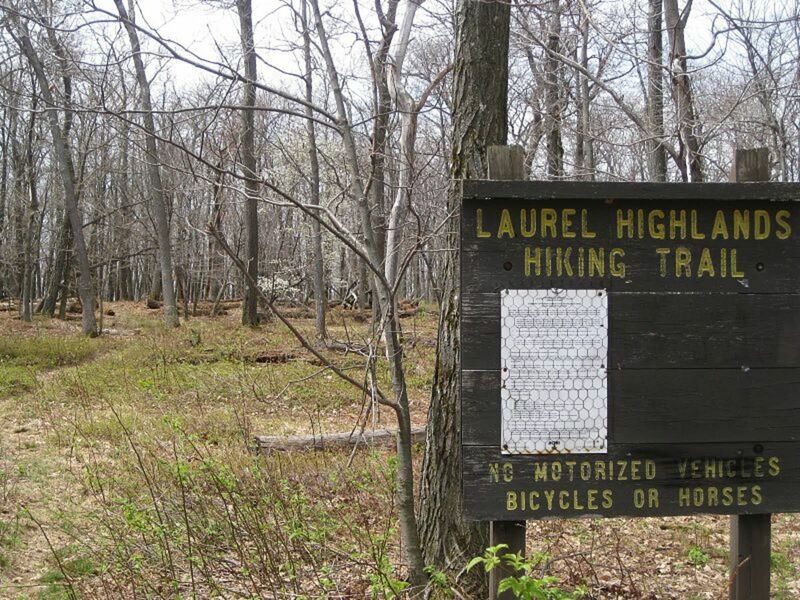 As with anywhere else in the National Park, a backcountry permit is required for an overnight stay along the South Bass Trail. 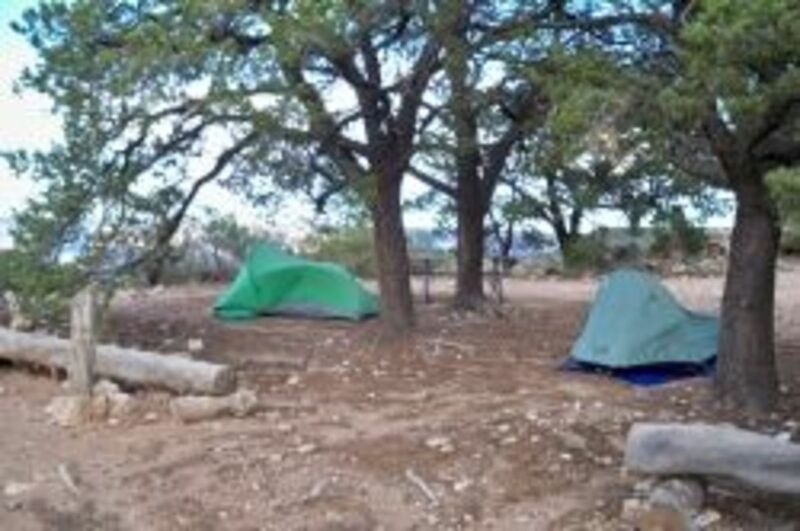 Camping here is "at large," as there are no established sites below the canyon rim. There is also no water at the trailhead -- not until you get to the Colorado River, more than 4,400 vertical feet below and 7.8 trail miles later. Here, I'll tell you about this remote, "non-corridor" trail and show you photos from our four-day trip, as well as suggest some good reading material about different aspects of the Canyon. **Please understand that my trip report and description of South Bass Trail isn't meant to be a guide. I strongly suggest obtaining a trail map and official description of the route, as there are spots where well-intentioned though poorly placed cairns, perhaps left by other hikers, and intersecting trails can lead you astray. I've met the author of this and other Grand Canyon guides, and I highly recommend his books. Scott really knows what he's talking about, because he's "been there, done that" many times. Smart guy, too. This is a Kindle edition, published by the nonprofit Grand Canyon Association. In addition to the physical, cultural, and historical background of the South and North Bass trail, you'll get specific safety advice and trail distances; learn how to recognize geological features; and get detailed maps, vivid images, and comprehensive information that will not only help you to appreciate the incredible landscape, but will also alert you to its hazards. 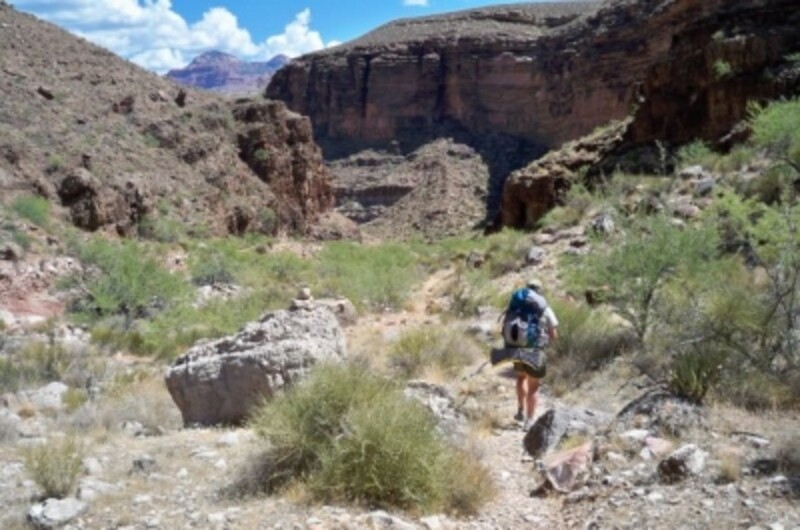 This trail and its counterpart on the other side of the Colorado River (the North Bass Trail) are named after William Wallace Bass, who began his tour operations at Grand Canyon in 1883 and constructed more than 50 miles of inner canyon trail, most of which can still be hiked today. Like most trails in Grand Canyon, Bass's trails started as animal paths and Native American trails, some of which led past granaries like the one pictured here, used for storing dry goods. Bass then adapted these preexisting trails to his purposes, which included--like that of many white pioneers at the Canyon--mining below the rim. The Havasupai Indians showed Bass many routes, which he originally used to haul loads from his mines. 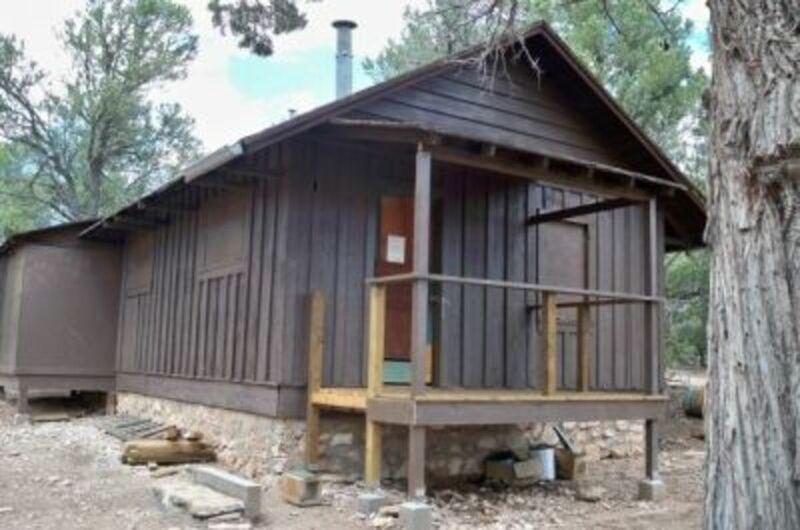 With tourism being much more profitable than mining, Bass built camps with overnight accommodations along the trails as rest stops for his visitors. Bass married in 1894 and raised his four children in his camps at the rim, in the Canyon and at the river. When the Fred Harvey operation came along further to the east in what is now Grand Canyon Village, the tourist dollars that once went to Bass moved east as well. In 1923, William Bass gave his last tour. At one time, the 14-mile North Bass Trail was connected to the South Bass Trail via a cable car that crossed the Colorado River. That tramway no longer exists, so the river crossing can now only be made by boat. Today, the South and North Bass Trails have been rerouted, since several original sections were washed out or buried in rock and mudslides. 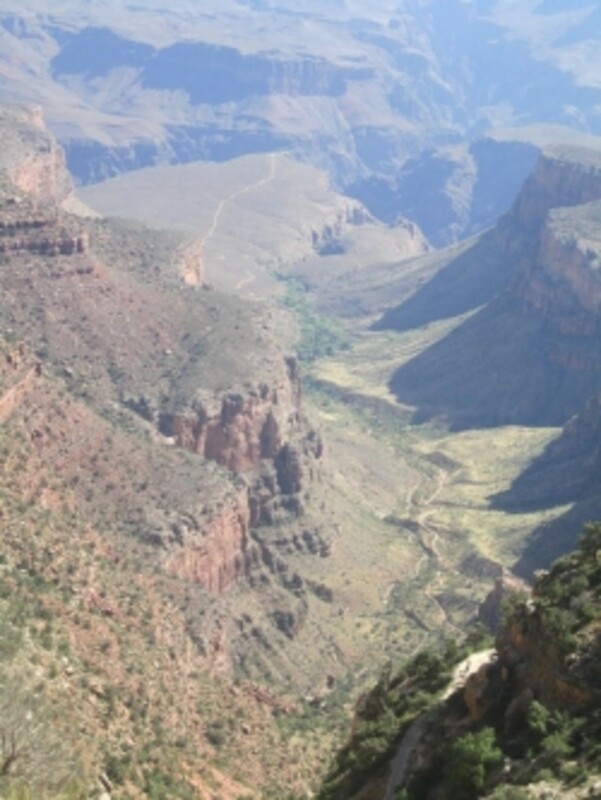 You can read much more about William Wallace Bass and his trails in Nature, Culture and History at the Grand Canyon from Arizona State University. 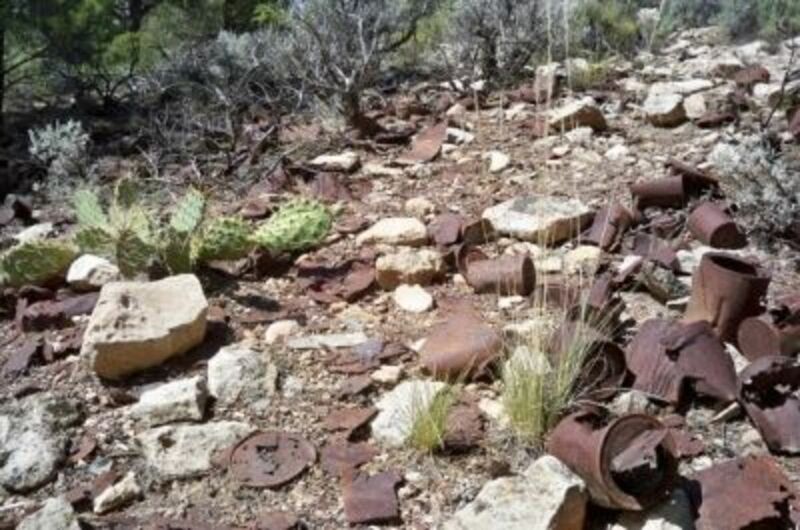 Historic trash at Bass Camp on the South Rim near the trailhead. Since it's more than 50 years old, it can't be removed. Plan a couple of hours from the highway. From Highway 64, before the South Rim entrance to Grand Canyon National Park, you'll need to turn left on FS 328 and drive 30 miles on unpaved Forest Service, Havasupai Reservation, and National Park roads to get to the South Bass trailhead. 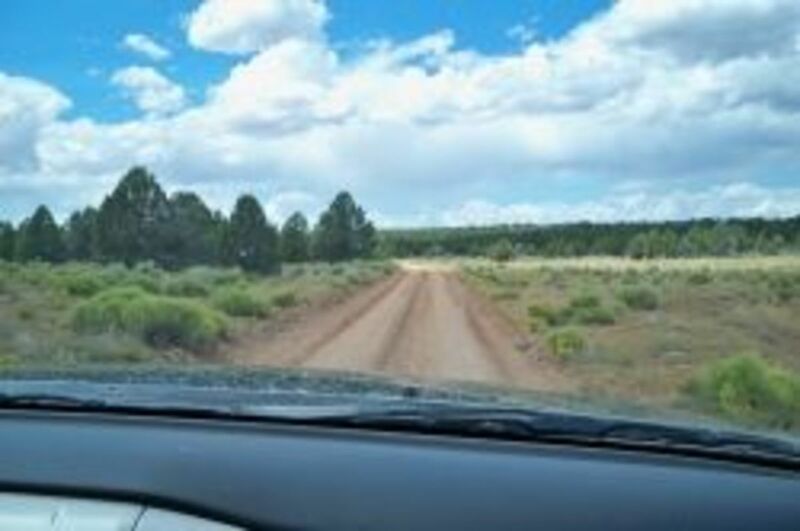 When the roads are dry, any relatively high-clearance vehicle can make the trip, although some sections are quite rough, especially the 1.8 miles that pass though part of the Havasupai Indian Reservation. A four-wheel drive vehicle would be preferable and, if there's recently been any rain, a necessity. And if it really rains hard, I wouldn't want to take any vehicle out there until there's been some drying time. Also, be aware that the Havasupai charge $25 to pass through their gate and drive those 1.8 miles through Reservation land en route to the trailhead. On occasion, as when Sueanne and I entered, there was no one home in the little building near the gate, so we simply let ourselves through. But chances are someone will be around when you leave, and they might charge you then. By the way, when passing through the next gate and crossing the National Park boundary, be sure to close it behind you so the cows don't get through. We saw cows on the wrong side of the fence and, after our hike, reported that to Park rangers, who rolled their eyes at the news. I guess a round-up was in store. Note: There is no commercial shuttle service to the South Bass Trailhead. SueAnne checks to see if anyone is home at the gate. No one's around, but she gets nipped in the calf by the puppy. This is the story of one of the first groups of Indians to arrive in North America about 20,000 years ago. The book takes you up through the Havasupais' struggle to regain traditional lands taken from them in the nineteenth century. At the South Bass trailhead, there's ample space for camping on either side of the parking area, along with a couple of picnic tables. 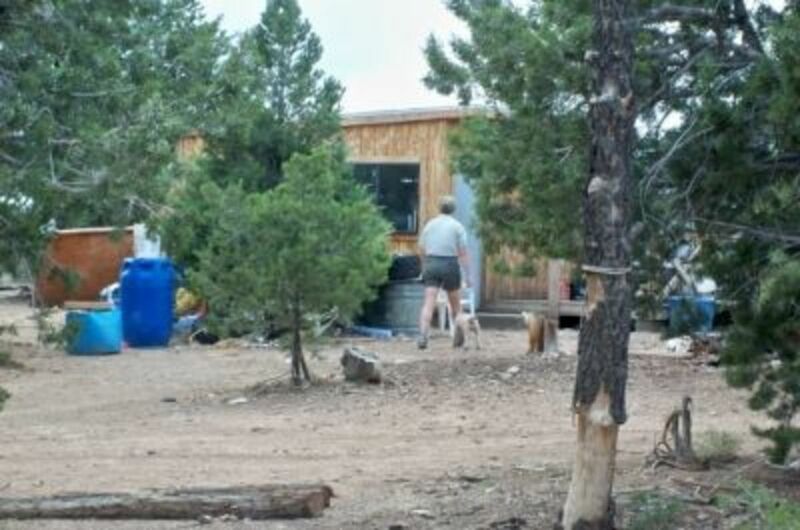 There are no facilities at the trailhead, however--no water or bathrooms--so your backcountry trip has already begun by the time you've reached the rim. Sueanne and I arrived at the South Bass trailhead mid-afternoon. 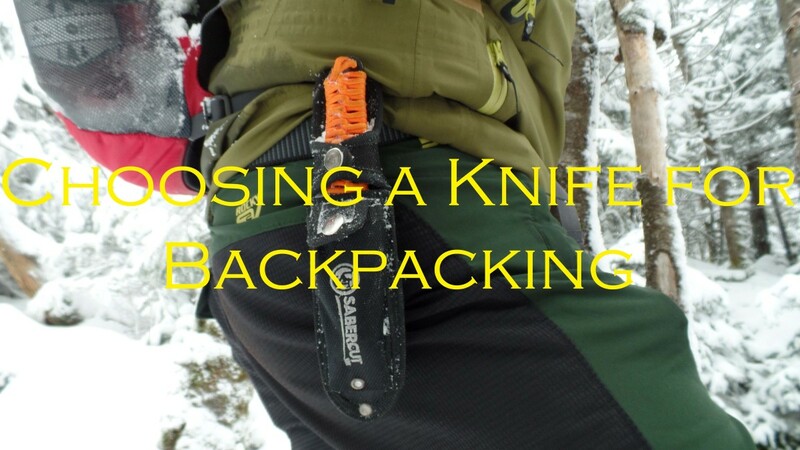 At first, we considered hiking just the 1.3 miles down to the Esplanade and camping there, but with some dark clouds moving in and the brief, light rain that followed, we decided to pitch our tents at the trailhead and start out early the next morning. As the storm clouds moved off, it turned out to be a beautiful evening. We explored the indian ruins and remains of Bass Camp in the area, then took out the Crazy Creek chairs that Sueanne had thrown in the truck and enjoyed the sunset and changing colors of the Canyon. 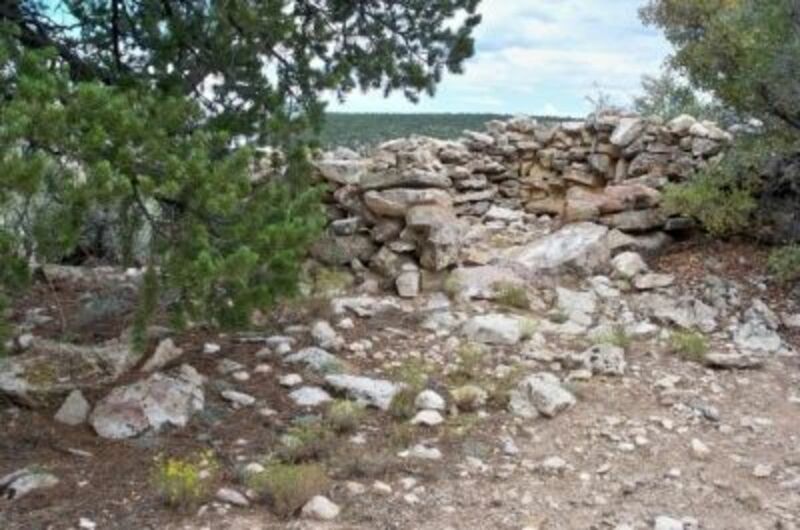 There are indian ruins (pictured here) and remnants of William Wallace Bass's camp to explore near the trailhead. We watched the sunset and changing colors of the Canyon from the rim, where we camped the first night. 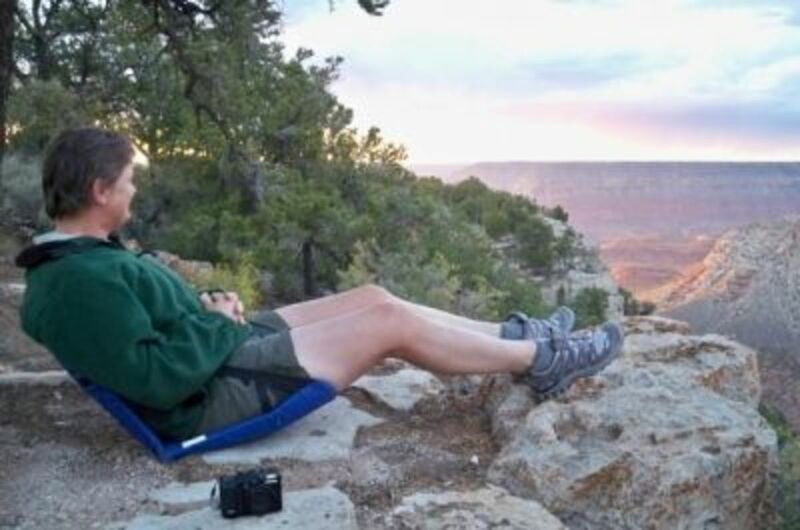 Enjoying the Canyon from the rim in Crazy Creek chairs--what a relaxing evening! This is a look at the pioneer history of Grand Canyon, from its earliest residents to the creation of the national park at the end of the pioneer era around 1920. The book includes 200 historic photographs and a dozen custom maps of the region. 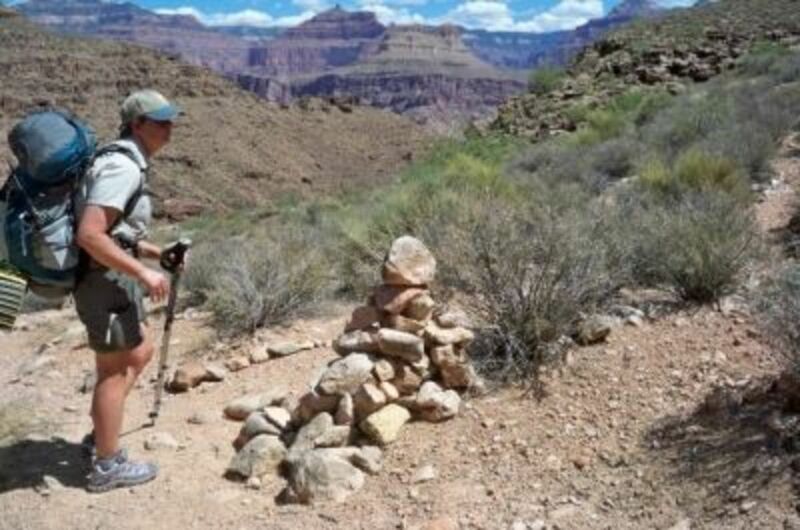 For a remote Grand Canyon trail, the South Bass is in great shape, thanks in large part to some extensive trail maintenance that was done about five or six years ago. 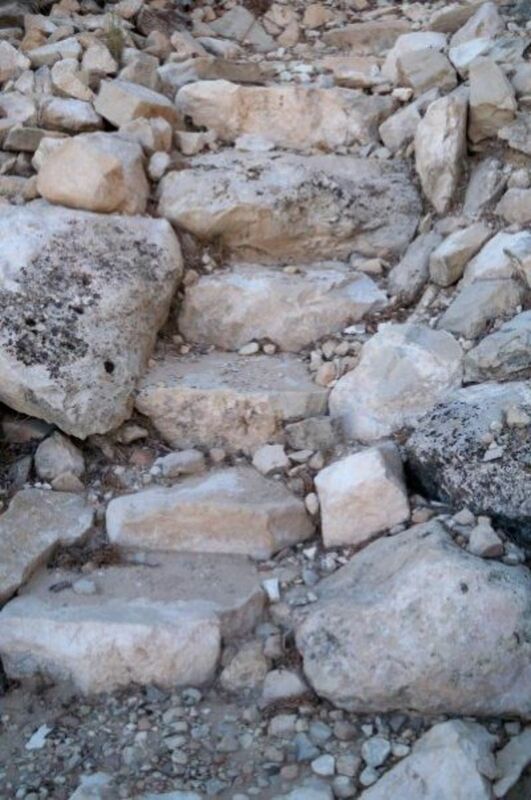 That hard work--to make an understatement--included the construction of numerous sets of rock steps (pictured below) and, as far as we could tell in comparison to earlier descriptions of the trail, some brush clearing in the Redwall section. 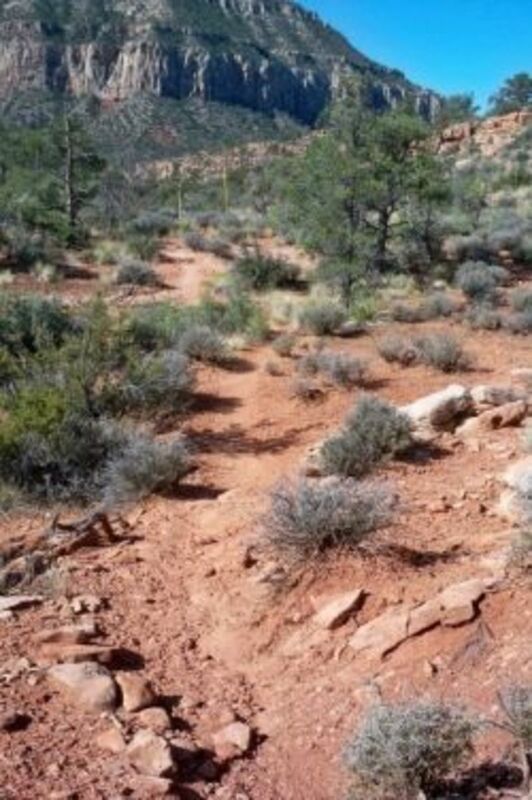 Leaving the rim, you pass through an area of pinyon/juniper over loose rubble but otherwise excellent trail. 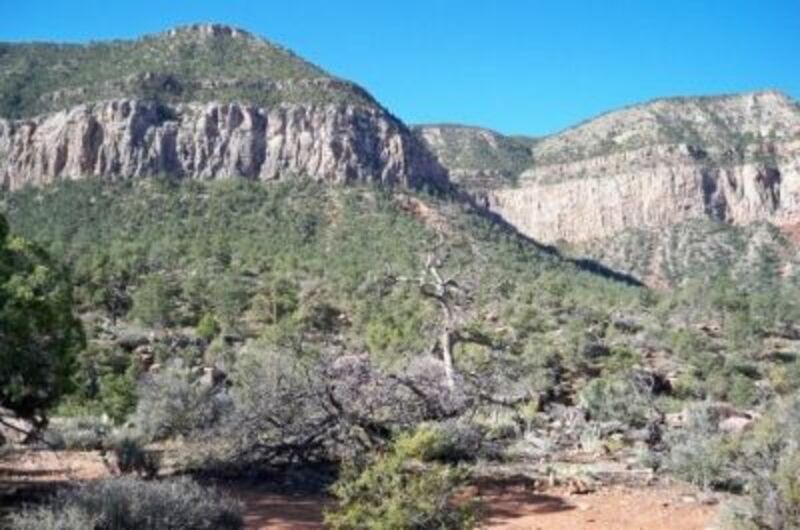 What I'd read would be an "exciting descent through the Coconino with 300-foot sheer drops along the narrow trail," turned out NOT to be the nail-biter I'd expected. I didn't find it scary at all and, though the scenery was absolutely beautiful, the description I'd read in one guidebook was exaggerated, in my opinion. And I'm usually very nervous about exposure. So no worries if you're a hiker like me, who doesn't like walking on the edge of a very long way down. Five years ago, extensive trail work was done on South Bass, including the construction of numerous sets of rock steps. A view of the Canyon as we descend through the Kaibab Limestone and Toroweap formations. 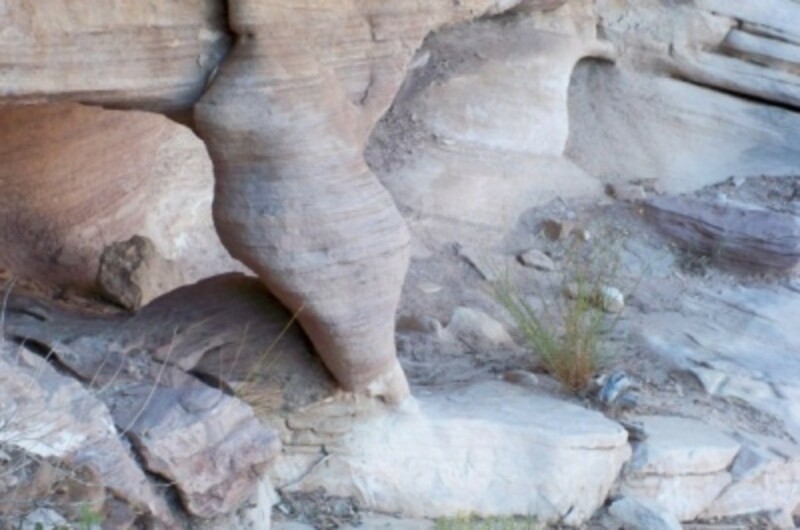 You see some really interesting rock formations on a smaller scale too. This book combines hiking and geology, including 18 treks with something for everyone--from the popular rim-to-river trails to easy, half-day rim walks to rugged and remote, multi-day backpacking trips. 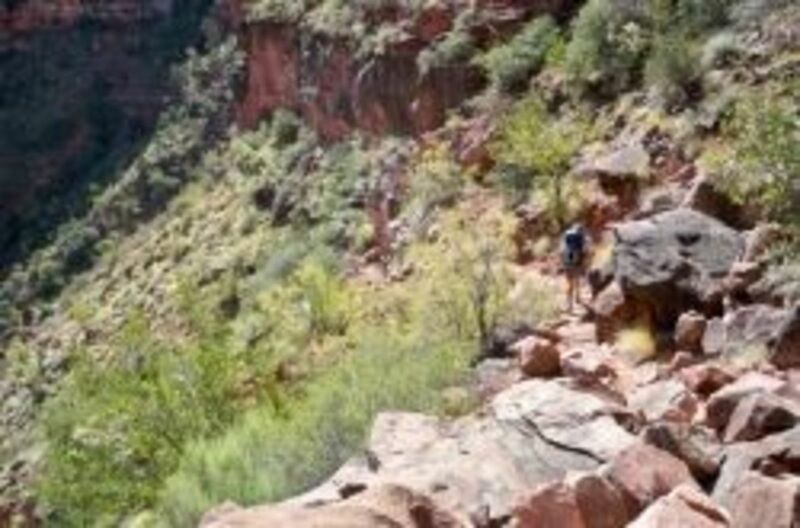 Thirteen hundred feet and 1.3 trail miles below the rim, after passing through the Kaibab Limestone, Toroweap Formation and Coconino Sandstone layers, you'll come to the platform on top of the Supai layer known as the Esplanade, a relatively flat "shelf." 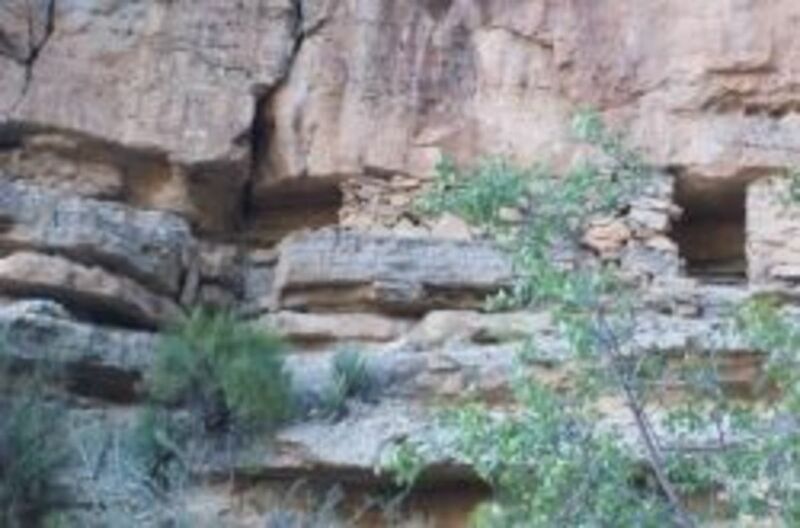 In this area, the Esplanade is covered with vegetation, whereas, in other parts of Grand Canyon, it's nothing but rock. Here, Sueanne and I cached two gallons of water in a shady space beneath a leaning rock, hoping it would be sheltered from both morning and afternoon sun. We both recorded the location on our GPSes and noted the significant features around the site, where we planned to camp on our return hike to the rim. With no reliable water between our stash in the vehicle above and the Colorado River, other than the potential for some rain-made water pockets, we made sure we'd have enough to get us through our last night of camping and return hike. 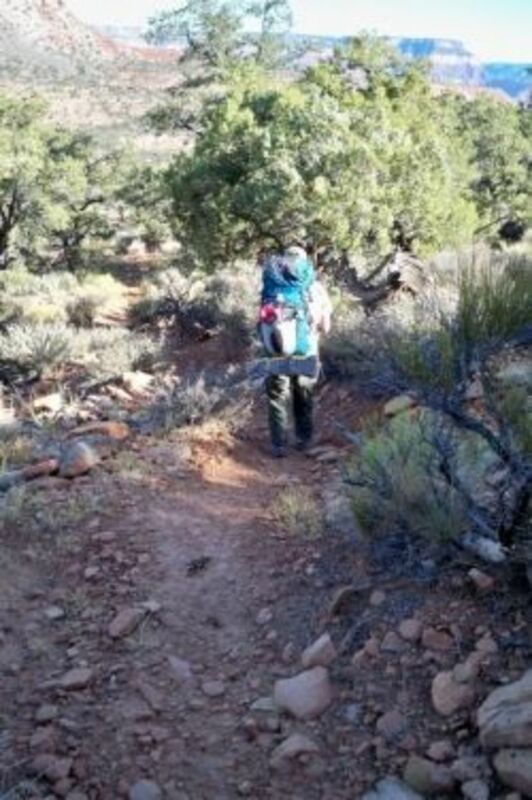 I recommend at least the one cache and carrying a gallon of water on the trail, especially in the extreme heat of summer. You can then filter more water at the river. Rocks line the path on part of the Esplanade, to keep hikers on the trail and off the fragile crypto-biotic soil. 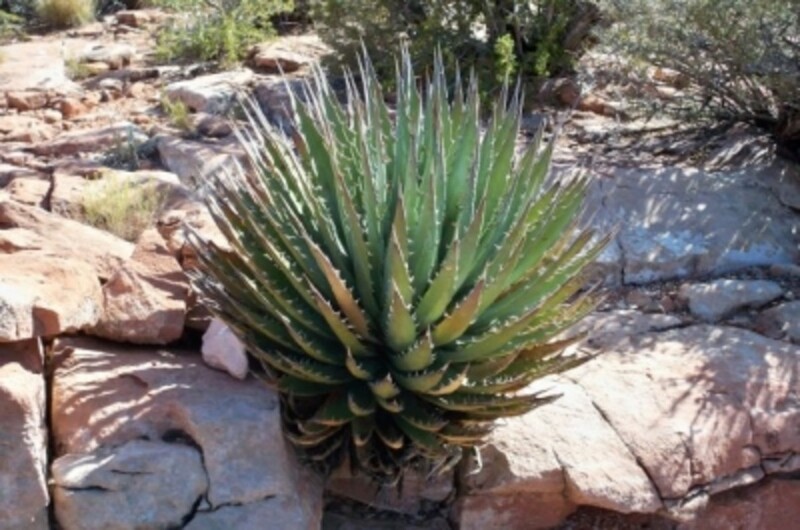 An agave, with its razor-sharp leaves. This was a very important plant to the Native Americans and a staple of their diet. The scenery here is amazing! Now, here is where you'll find some exposure, with relatively narrow trail bordered by a long way down. But, still, it's not something that bothered even me. There was good footing, a nice visual barrier of rocks along the edge of those narrow stretches, and little chance of falling unless you were to try a back flip maybe. And, wow, talk about beautiful! After leaving the Esplanade, the trail leads hikers down a series of those amazing rock steps, a number of short, tight switchbacks and then a couple of very long ones, before dropping down into Bass Canyon. Though somewhat brushy and rocky, that amazing canyon does afford some relief from the brutal summer sun, shading travelers with its high, sheer walls. Along the way on the west side of the canyon, you'll see a large cave, which is likely a haven for bats. The trail switches back and forth along the Redwall, eventually dropping into Bass Canyon which provides some nice shade. 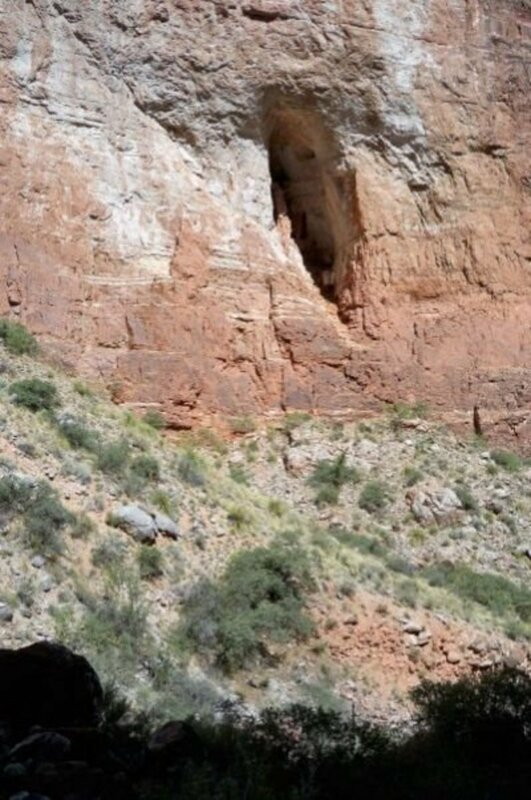 A large cave in the Redwall. The photo doesn't accurately depict its size--maybe 75 feet high at the opening. 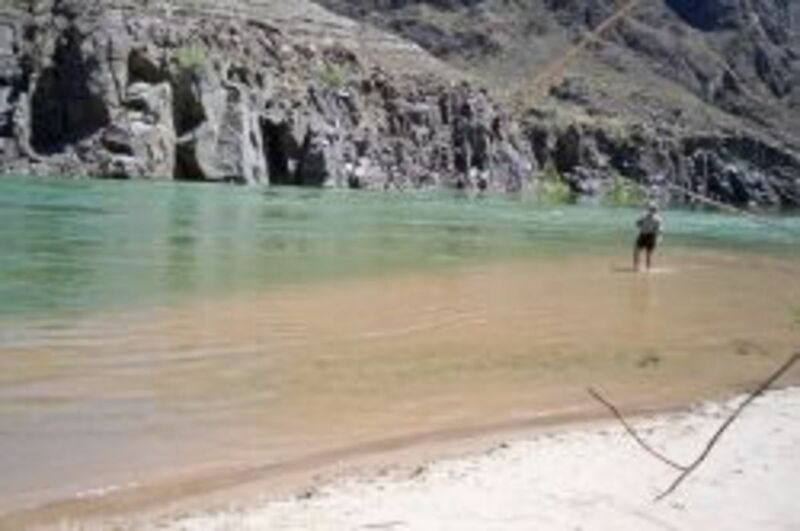 After emerging from the Redwall, things really started to heat up in the midday sun, with no shade to be found most of the rest of the way to the Colorado River. At this point, you'll need to watch for rock cairns as you begin to cross and re-cross a widening wash as many as nine times (though I lost count somewhere along the line). You may or may not notice the cairn marking the intersection with Tonto Trail west, but you'll probably see the prominent cairn further down the South Bass at the intersection with the east Tonto. Be sure not to take the next trail that branches off to the left, unless you're intending to take that longer route to the river, below Bass Rapids. Given that the switchbacks to the river, at least as shown on the map, look much less steep than what we'd soon encounter, Sueanne and I wondered if perhaps that longer route to the Colorado was the one Bass used when bringing mules down the trail. Also, when you come to a decision about going right or left to bypass a dry fall, take the right-hand route. The narrow trail will lead you up, high above the wash, and then back down to the bottom again. 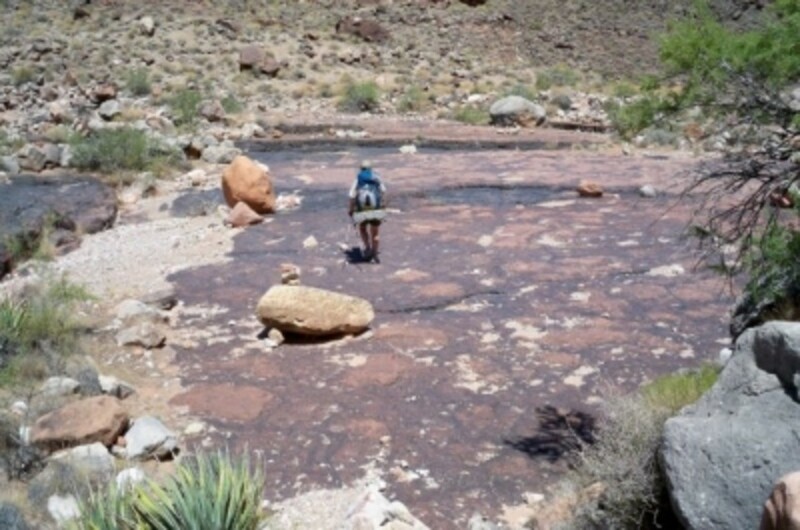 Eventually, just when you start to think the Colorado River may have dried up, you'll round a bend and, within a quarter mile of the cairn marking the first scramble down to the river, you'll hear and see the blue, green or reddish-brown ribbon of water, depending on its mood (and silt content that day). You'll first pass by Bass Rapid below, but the descent will bring you back to the top of it. At the large cairn, you'll begin to pick your way a couple hundred feet down to the beach. If it's as hot as it was when we climbed down, some gloves would be a good idea. Those rocks were scorching! 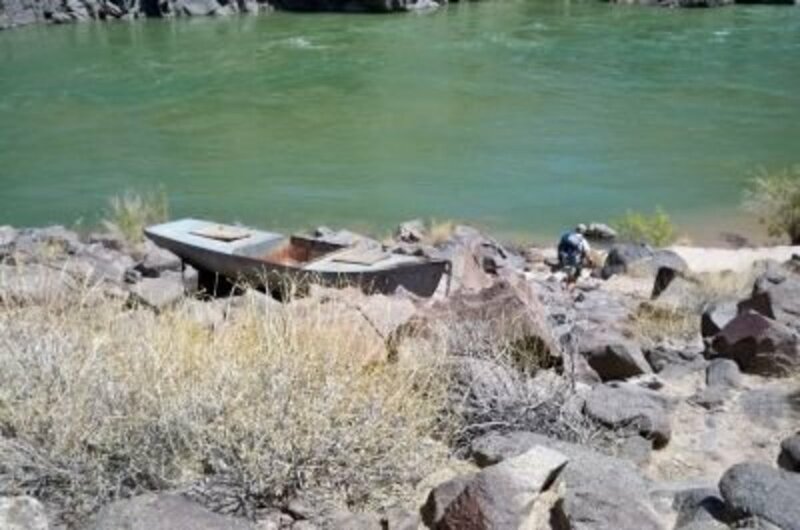 Soon, you'll see the old Ross Wheeler boat chained on the rocks above the high water line, and then you can shed your shoes at the edge of the fine, white sand and cool (that is, chill) your feet in the mighty Colorado. Just don't walk out too far, okay? That current is fierce out there, as you'll see when the river runners float quickly by ... unless they stop to share your beach. No worries, there's plenty of room for camping along the shore, upstream, where you'll find a pretty grotto, likely with a shadowed, rain-filled pool at the bottom. FYI: If you pass by the cairn up on the main trail and continue on the South Bass, there's another route down to the river below Bass Rapid. This will lead you to the site that once was home to a cable car, where rim-to-rim travelers could cross the Colorado and head up the North Bass Trail on the other side, or vice versa. Beyond that route is the intersection with the longer route I mentioned earlier, with the third set of gentler-looking switchbacks to the river. The temperature soars near midday as we pass through the Tonto, where there's no shade to be found. We cross a widening wash as many as nine times. 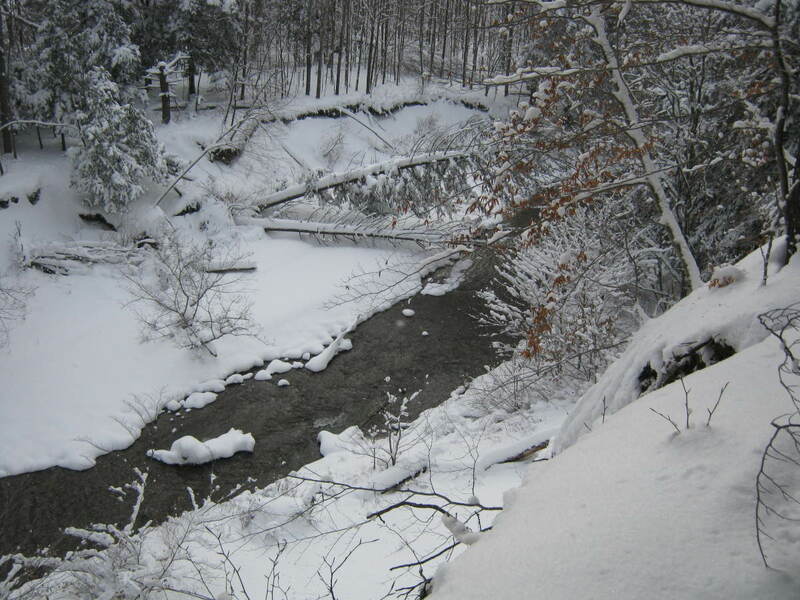 We know the refreshing river is getting close. We spend the rest of the day and night on the beach above Bass Rapids, where we sleep under the stars. The Ross Wheeler boat, abandoned here in 1915. Get to know the men and women who have run the Colorado through Grand Canyon, some of the most challenging whitewater in North America. From The River Back To The South Rim: Why Not Make it a Two-Day Return Trip? From our riverside beach near the Ross Wheeler boat, we had a 7.8-mile hike back up to the rim. Sueanne and I awoke before dawn, packed up our sand-covered gear, filtered water from the river, which had receded considerably during the night, and started out with the aid of our headlamps. Even in the dark, the scramble back to the main trail was easier going UP than it had been coming down. At about 5:30am, just as we were crossing the dry wash for the first time, we were able to turn our headlamps off. The hot sun didn't catch us until we'd climbed out of Bass Canyon. By then, we were a couple of miles from the Esplanade, where we'd cached those two gallons of water, so we kept moving along. At 10:30am, we retrieved our water cache, still cool in the shade of that big rock, and crawled into the small area of shade beneath a juniper. And that's how we spent the rest of the day--following the shade from tree to tree--until the sun dipped low enough that we could set up our tents and cook dinner in comfort. After a quiet night, this time not lulled to sleep by the sound of the river but by crickets instead, we started up at first light. In just over an hour, we were back at the rim, where we ate a breakfast of champions--Twizzlers and Pringles! This guide was written by a man who knows the Canyon better than most. He's also from here in Flagstaff, Arizona, now my home as well. 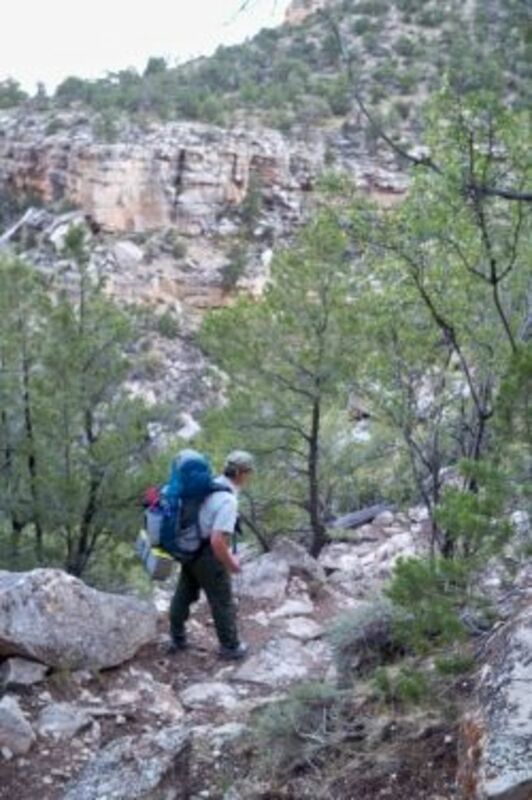 The Official Hiking Guide of Grand Canyon National Park provides profiles and maps of major trails, beautiful photographs, as well as current park regulations and permit procedures. A pictorial guide to one of my favorite (long) dayhikes from -- and back to -- the South Rim of the Grand Canyon. 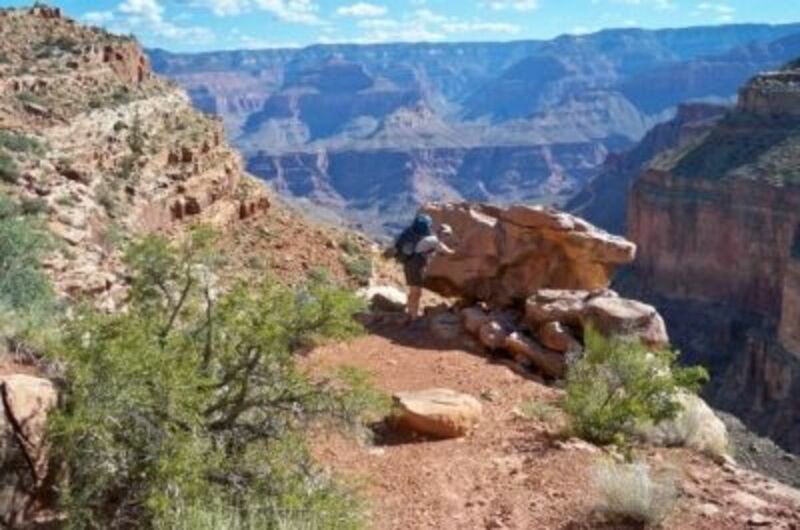 There is SO much I could write about hiking in the Grand Canyon, but I want to focus on hiking rim to rim using the "popular" trails in the central part of the National Park. Have You Been To Grand Canyon? 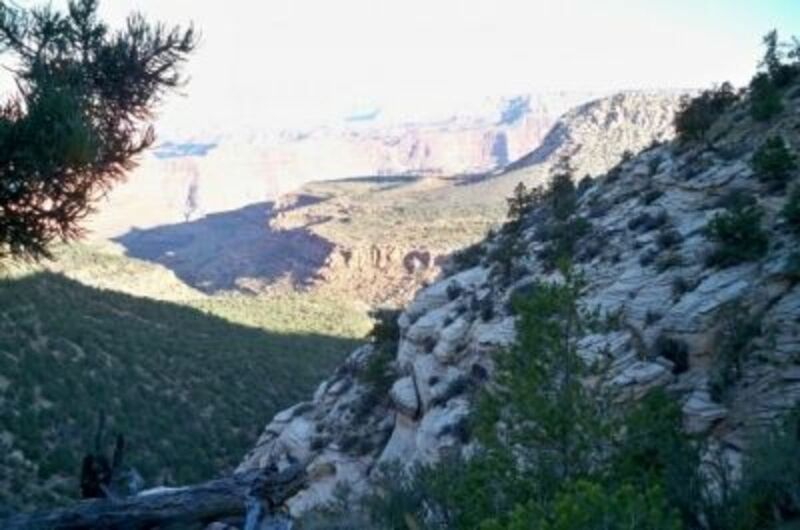 - And, if Yes, Have You Hiked Below the Rim? 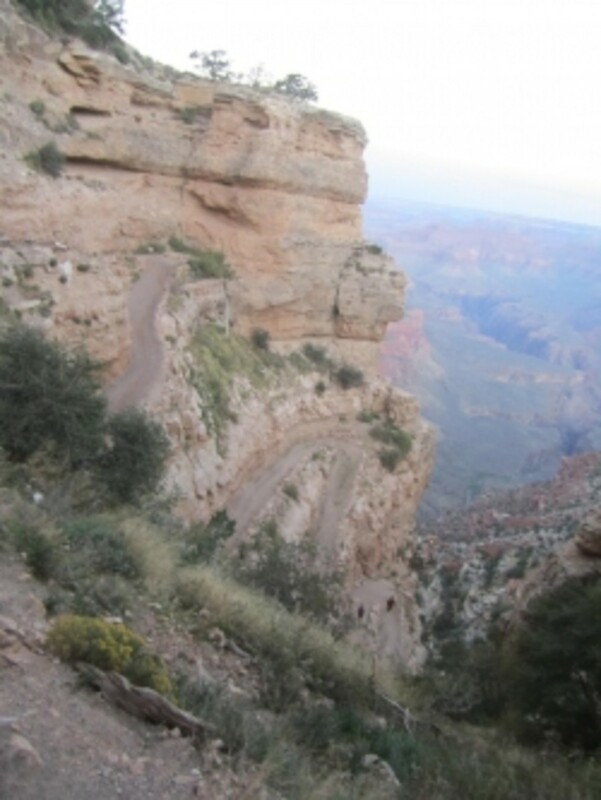 I have visited the Grand Canyon twice before, but only hiked the Bright Angel Trail a little way into the canyon before we ran out of time and had to return. I have been on a boat tour down the Colorado through Glen Canyon though after an early morning flight over the Grand Canyon. That was an incredible day! I would love to do some longer hiking through trails like this one. It looks really amazing! Have hiked most of the inner canyon trails starting as a 20 year old college student (first hike was all about the geology) and still hiking there as a 64 year old. My favorite was hiking down Grandview, around the back of Horseshoe Mesa into Cottonwood, Grapevine, Cremation, and out Bright Angel. Bass is on my "to do" list. @anonymous: I believe you're asking Karl ... but, speaking for myself, no, I haven't. No yet, that is. @anonymous: Have you been up the North Bass? Hi there...in 2005 I was one member of a group of volunteers who worked on re-hab'ing the trail which included the building of those steps and rock walls... Glad to see that they are still holding to this day... I look forward to heading back there someday and hiking to the river... thanks for the shots. I've been there several times. 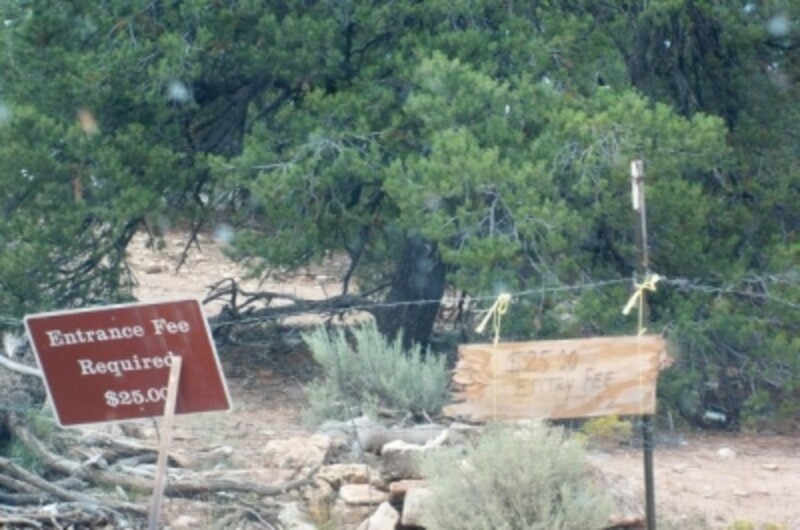 First time as a teenager and my brothers and I hiked to Phantom Ranch, overnighted and returned the next day. Then when I graduated from high school, I was going to do a rim to rim but the north rim was closed so I did a rim to roaring springs and back. In college i did a down and back in one day trip with a girlfriend. Finally in my 30s I did a north to south rim trip as a graduation tour present for an exchange student. Love your hiking lenses. I've featured many of them on "My Grand Canyon Hike to the Bottom" lens. I did as a kid, but we didn't hike. Never been there. Good job on your lens...the next best thing to being there I'm sure. I've been there but haven't had the opportunity to do the trails yet. Can't wait to experience the canyon in a more up close and personal way. Thanks for the great preview. Yes I had being to Grand Canyon last year. 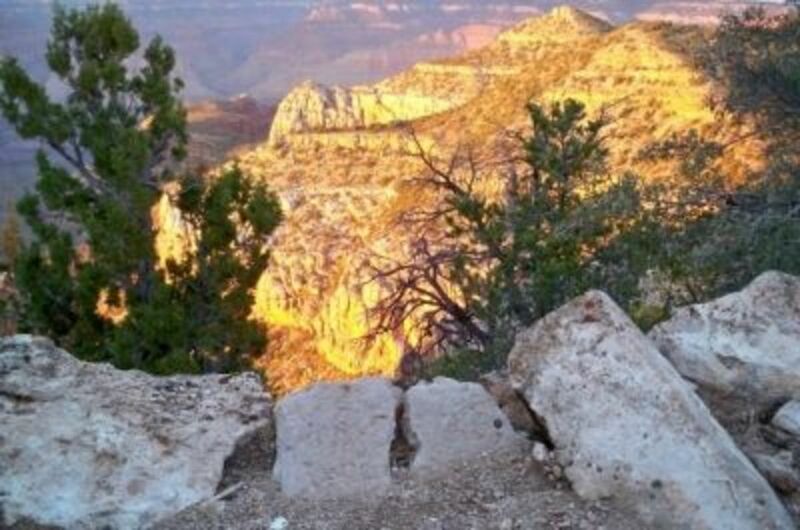 My campaign covered few hiking spots namely Bright Angel Trail, South Kaibab Trail, Rim Trail, Hermit Trail and Grand view Trail. No I have not! It looks like a great adventure though! Fantastic views!! 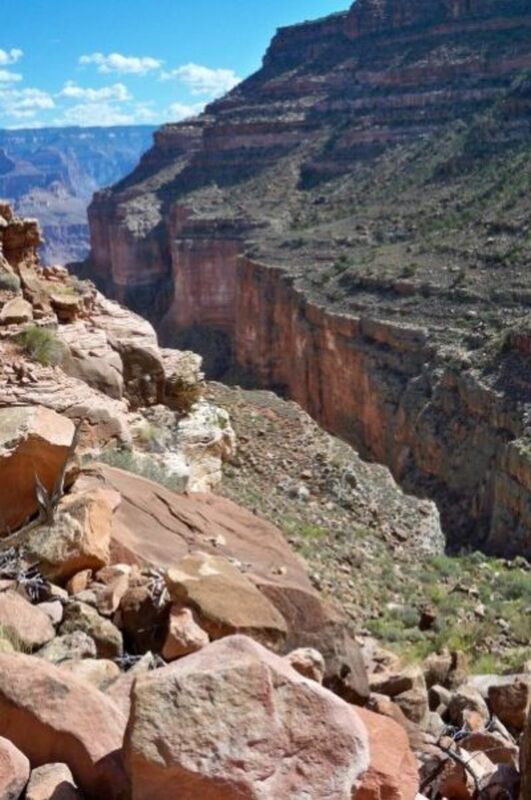 Being fairly close to the Grand Canyon, I know what it takes and salute anyone who has hiked in and out. I have as of this date only hiked on the rim, but I am planning a trip on the South Bass in late March, and your information will be most useful. Thanks. 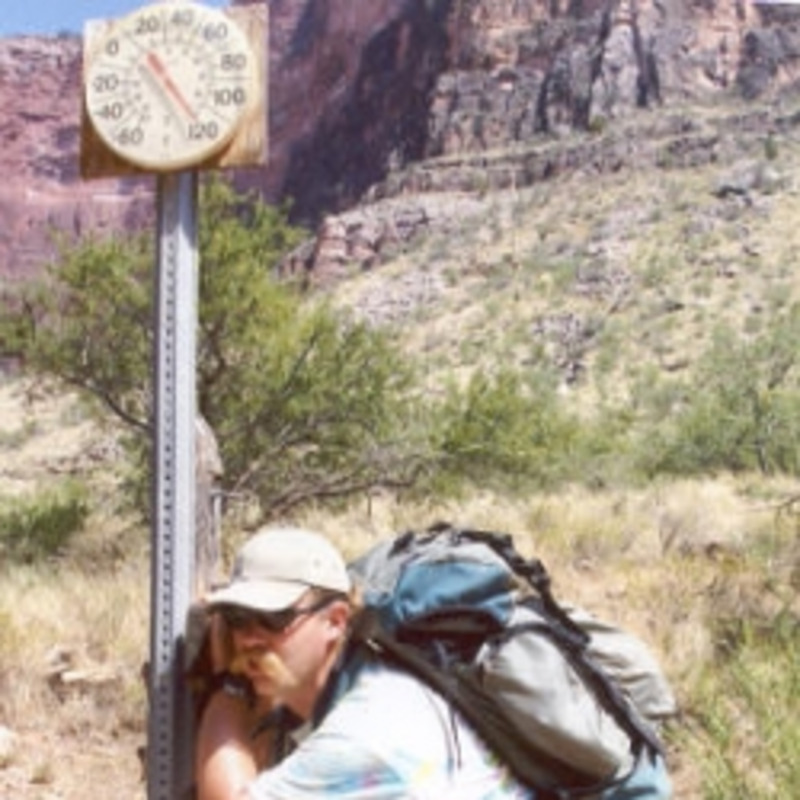 Yes I have hiked many trails in the Grand Canyon plus I took a raft down under my own permit in 2000, awesome place. I want to hike the South Bass to Hermit this year. I've seen the Canyon but never left the rim - your lens let me feel like I was really hiking the trail. Thanks! I enjoyed reading your account and looking at the pictures. 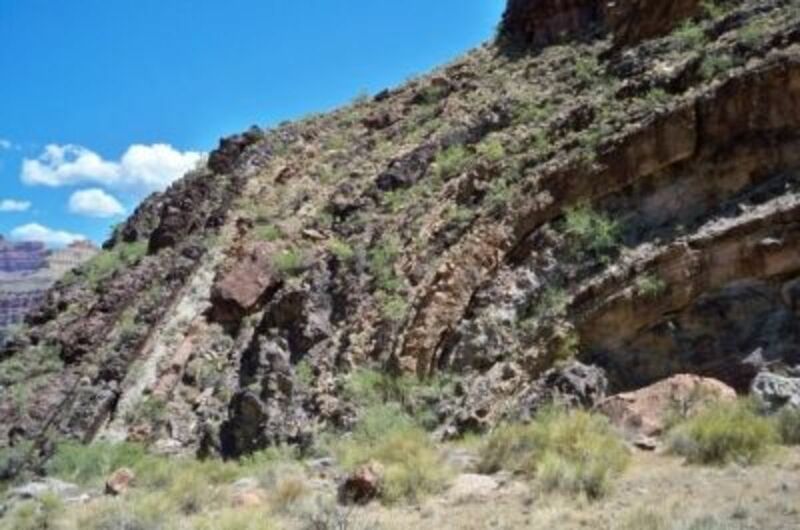 It would be great to do the hike with someone who knew geology, archaeology, botany, or etc. I am now up to 1800 miles in the Grand Canyon. 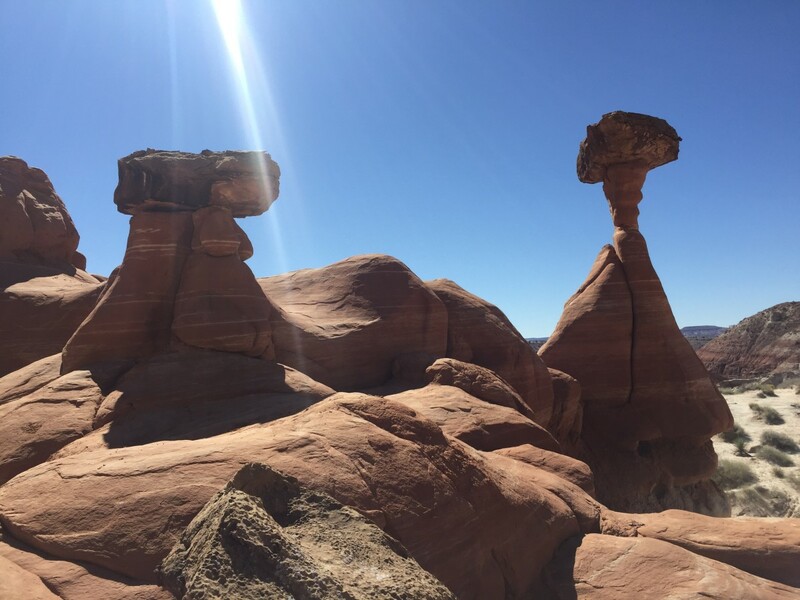 I have hiked all the 'named' trails from the north rim to the Colorado, all the trails from the south rim, and from the Little Colorado River to Elves Chasam using the Tonto, Escalante Route, and the Beamer Trail. 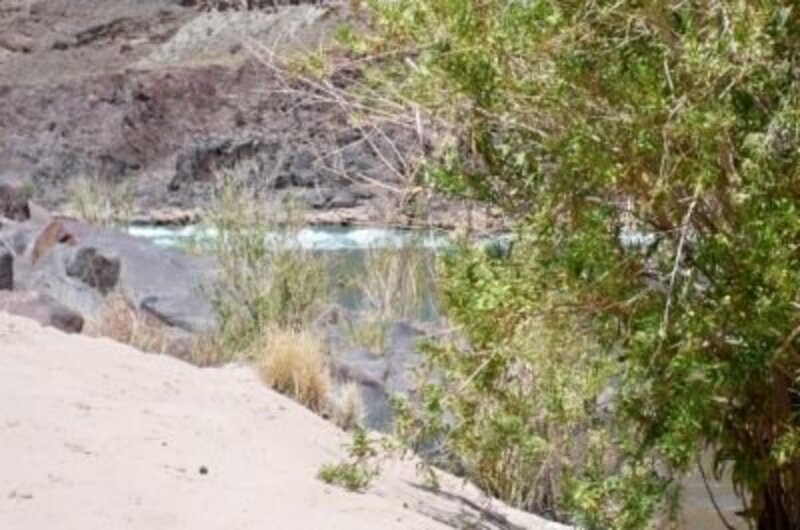 In addition, I have done the Havasupai trail to the river numerous times. I will be 68 years old November 2009. Last year I crossed the Canyon on the main trail two times in October and I hiked the Hermit, Tonto to Indian Gardens, and to the rim in October of this year. Do it while you are young. It doesn't get any easier. Amazing photos and sounds like quite the hiking trip. I have not yet been to the Grand Canyon but this makes me want to go soon. Fascinating lens. Quite some strange geological formations over there (at least to people like me who are only familiar with mountains like the European Alps). Went to the Canyon for the first time in May. Had the wife and middle son (5) along. When we got to the South Kaibab TH, he noticed the hikers below and asked how they got down there. When I showed him the TH and explained that it went to the river, he says, "Well let's get going." He was disappointed that we couldn't go all the way that day. We did hike down a ways on that trail as well as Bright Angel and Grandview. I promised him that we'd come back and do it all when he got a little bigger. 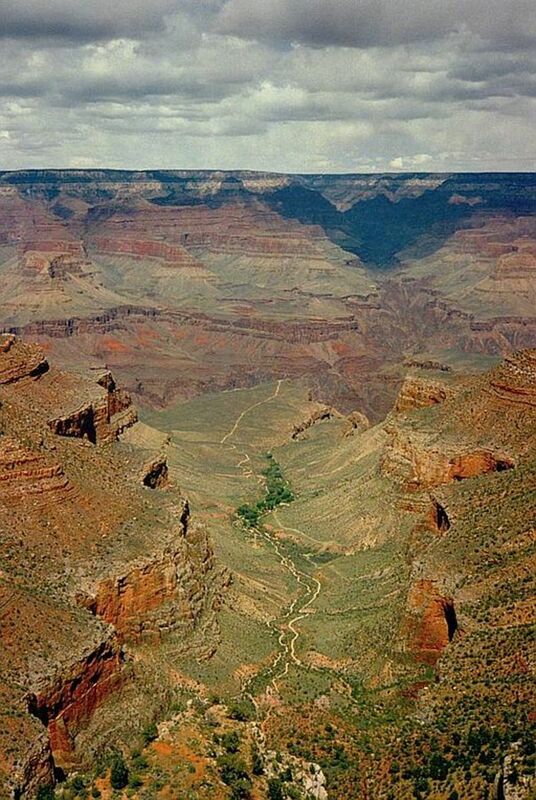 I visited the North Rim of the Canyon 15 years ago. I took my two daughters there after their father died. He had planned and booked the trip almost a year before his death. I would love to go back and visit. We only did the "newbie" trails. I never realized that trash over 40 years old became historic! Well since I only have a few years before I hit that number...I will soon be protected! LOL Great lens, I love the sunset photo, so beautiful! It sounds and looks awesome. 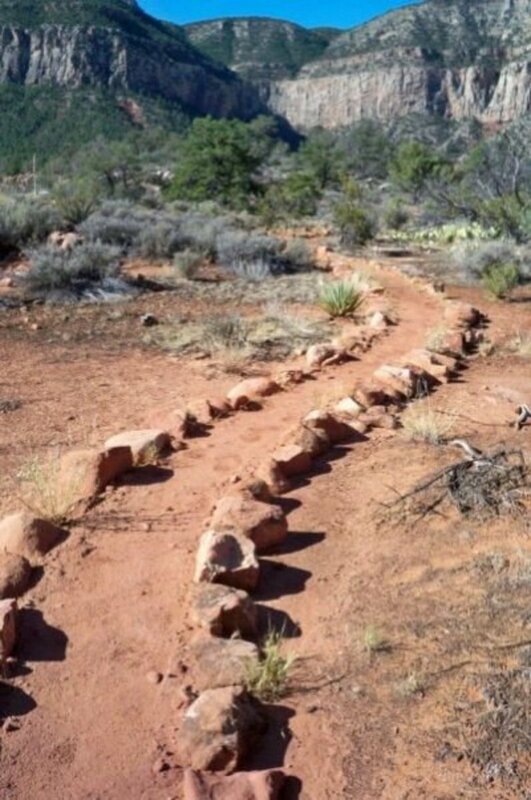 I can't wait to do this trail.